Anyone that’s ever glued up a panel, and done it the “wrong” way, knows a few things about the process… First, biscuits only offer marginal help. Wet glue is quite possibly the slipperiest substance on earth, and if misalignment can happen, it most certainly will, but not until the glue has set will it be noticed. Ultimately, Murphy lives, and he may be an optimist. 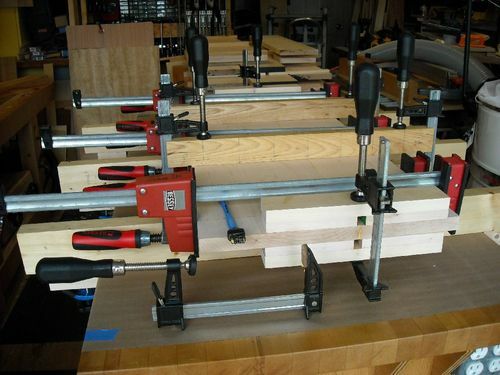 After struggling with a couple over the years, I finally broke down and spent a few hours building some panel glue up “helpers.” With the right shop aids, it’s not that bad of an experience, and it actually goes pretty well. 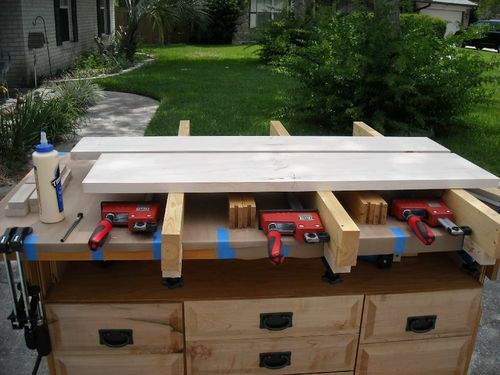 I posted my Shop Utility, Finishing, Assembly, Infeed-Outfeed Cabinets, and I make use of those for gluing up panels. For more on that project, see the actual web page. Some straight bars that raise the panel: they clamp to the assembly cart and raise the parts up so I can get clamps and cauls under the panel parts. Some clamping cauls in two different configurations: Some are what one thinks of as cauls, and the others are for the ends of the panels. A little wax to keep the glue from sticking, and these should last a long, long time. First, cover the cart with a little craft paper and clamp up the bars. 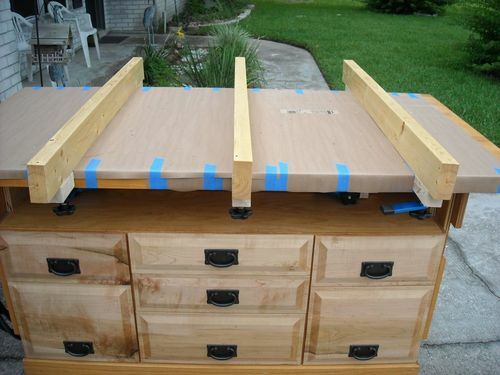 You can see the hold down clamps used to secure it to the cart top. Next, get the cauls and lower clamps ready. And finally, the cauls for the panel ends. It worked like a charm. It cost me a day… I made three sets of of 36”, three sets of 24”, and four sets of 16” cauls, the little sets for the panel ends, and the bars that clamp to the roll around cart. The cauls are some left over ash, and don’t have a tremendous amount of spring to them, but ash is so stiff, they don’t need it. I would have used a little more bend if I had made them out of a softer wood. How much taper on the cauls? Going to glue up a bench top 4”x24”x8’. 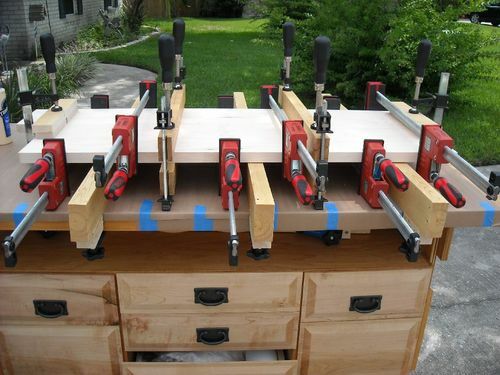 I’ll do it in 4 sections then glue up two of the sections and finally the final two. On one of the forum posts recently (but for the life of me I can’t remember which or who), somebody posted a sprinkle of salt on the glue joint to increase friction and reduce slippage. Chris, I’ve never heard of the salt thing… I’ll have to look into it. Kevin, there isn’t a lot. On the 24” cauls, I jointed the edges, marked a center line and then a line every 3” from there to each end. I took two swipes from each line to the end with a smoother set very fine… so it’s about .006” from the center to each end. Like I said, it’s ash, and for a light panel, it’s fine. 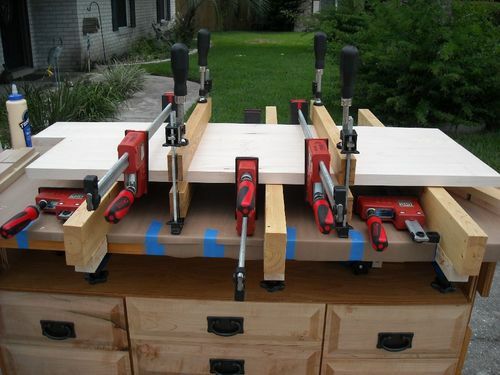 Having said all that, when I glued up my bench is where I gained some of my more hard earned knowledge. Had I used cauls to put that together, I would have wanted cauls with a little more clamping force to keep the timbers aligned. The easiest way to do that is to put a little more curve in the cauls. Sam, thanks. 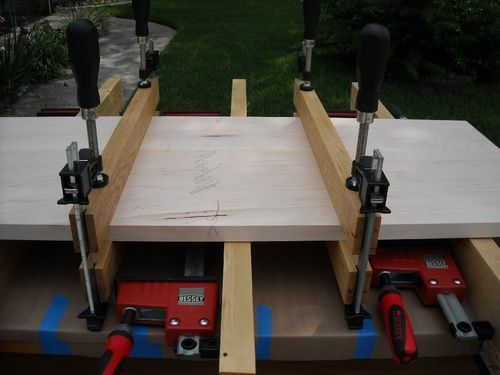 Top glue up begins a week from Friday, crossing my fingers!